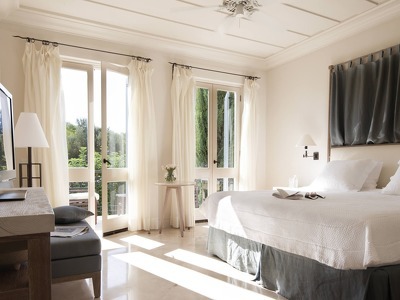 All of the rooms feature a Joelle Pleot décor inspired by the quintessential Mediterranean style of Cyprus, and the cool white interiors are complemented perfectly by the colourful backdrops of the gardens and green hills of Neo Chorio. 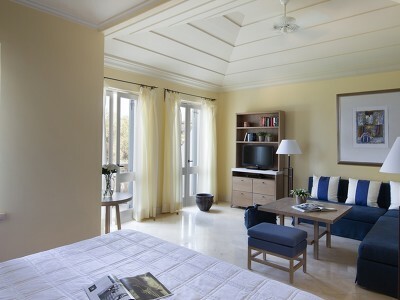 Many of the rooms and suites are interconnecting, making them perfect for families. These rooms showcase a thoughtful purity of design. 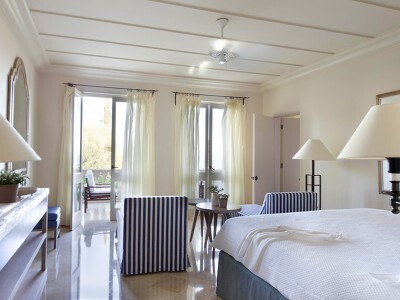 Each of the eight Garden View Rooms, sleeping a couple, is a cool Mediterranean style haven combining locally crafted furnishings, an uplifting generosity of space and colourful garden views towards Neo Chorio. Light, bright and characteristically ‘Anassa’, these 70 main building suites, each sleeping three, radiate a cool Mediterranean flair. Each features Joëlle Pléot designed furnishings handmade by local artisans; glittering sea views from step-out balconies; and airy living space for laid-back lounging. An additional cot or child's bed is available on request. Accessed via winding pathways, these 42 garden residence gems, sleeping three, effortlessly showcase Anassa’s elegant ‘at-home’ design. 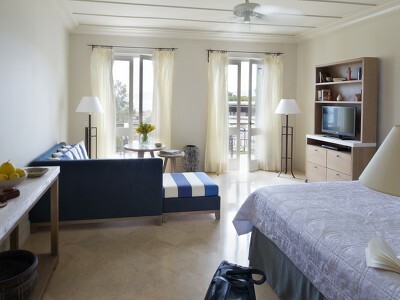 Luxurious fabrics in blues and subtle creams reflect the vibrant views of Cyprus’s unspoilt coastline from the suite. An additional cot or child's bed is available on request. Artisanal Mediterranean furnishings, uncluttered living area, and a bathtub big enough for two combines to create a feeling of airy spaciousness and relaxed elegance in these 16 rooms. Designed for three, with views out towards the sea this suite is a lovely option for a small family. An additional cot or child's bed is available upon request. 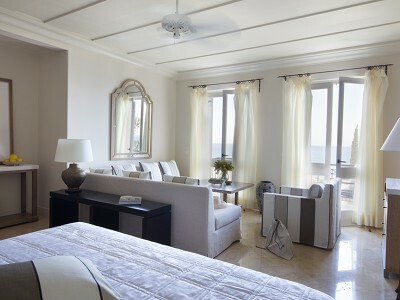 Spread throughout the grounds, with a comfortable lounge area and a view to the sea, these seven suites feel spacious and airy – aided by cool marble floors, light Mediterranean-style décor, sun terrace and private pool. An additional cot or child's bed is available upon request. A palatial retreat perched over the sparkling Mediterranean sea, Anassa is the original and still-unchallenged queen of Cypriot luxury hotels. From the gardens of bougainvillea, rosemary bushes and olive trees that gently slope down to the hotel’s beach, to the entry atrium complete with rippling water features and neo-classical details, the surroundings at this Chic Retreat are seriously luxe and the facilities are no less impressive. Immerse yourself in one of the three stunning pools, or let yourself be pampered at the world-class Thalassotherapy spa. For those that want to explore Cyprus and everything it has to offer, the team at Anassa can organise a number of activities from boat excursions to the Blue Lagoon to cultural trips around the island. After a day spent exploring or relaxing, there’s a wide variety of dining choices that will satisfy every appetite, whether you’re after formal fine-cuisine or laid-back Cypriot fare. Like sister hotels Almyra and Annabelle, Anassa is a family-friendly resort and there is a wide range of dining choices and activities for the whole family to enjoy. We were founded forty years ago by my father, the late Alecos Michaelides. Each of our three hotels is much-loved and entirely distinctive in their own way - Anassa is truly iconic, lavish in its designs and its facilities. We want our guests to come back again and again, and you can be sure of stunning views, sunshine, and real Cypriot hospitality - especially at the authentic Pelagos taverna, where you definitely shouldn’t miss the grilled octopus souvlaki. Unwind in the mediterranean garden, where there are plenty of shaded spots that are perfect for kicking back with a good book. The hotel’s pools are the perfect place to refresh yourself during the sultry summer, and you have the choice between a heated outdoor pool, an outdoor pool that is fed and drained by eye-catching cascades of clear water, as well as an indoor pool that has plenty of natural light, perfect for the chillier months. The outdoor pool area features a swim-up bar, so you wont even have to leave the water when you fancy a cocktail. If you’re in need of some pampering, then look no further than the Thalassotherapy spa. Focusing on the natural benefits of seawater, the spa features saltwater jets, seaweed scrubs, algae body wraps and many more bespoke treatments, all of which make use of seawater pumped straight from Chrysochou Bay. Massages and treatments feature plenty of natural and organic products, and there’s also a sauna and steam room, making Thalassa Spa one of the best holistic spa experiences in the Mediterranean. There are a number of activities on offer for those that want to explore Cyprus. Enjoy a sailing-boat excursion to the famous Blue Lagoon, or take a cultural trip around the island, which is filled with UNESCO-listed archaeological wonders, stunning Byzantine churches and picturesque villages. Sporty types can also enjoy water-skiing, diving, tennis, hiking, quad biking, and squash. Dine in style and savour seasonal and regional dishes across four restaurants and bars. Elegant dining, al fresco terraces, fine dining and relaxed or romantic settings are all there to be enjoyed by all the family. Basiliko is the romantic option - a candlelit cavern, it serves tantalising Asian dishes including Alaskan Black Cod and Grilled Wagyu Beef Cannelloni. Helios is fine dining at its best, complete with pianist, harpist and seaview terrace for al fresco dining. The dress code is smart-casual and as it is open for dinner only, no highchairs are provided so best for children from six years upwards. A la carte French-Mediterranean menus change on a daily basis. For a more casual dining room, head to Amphora and grab a table on the terrace to enjoy the sea views. Open for breakfast and dinner, Amphora serves local and international buffet breakfasts and themed dinners. For an authentic taverna experience book a table at Pelagos which offers shaded outdoor dining overlooking the gardens, pool and sea beyond. Fresh seafood, mezze, pastas and salads are served at lunch and dinner and it is an ideal choice for all members of the family. Children's menus are available at all of the restaurants at Anassa. Once a week in the Village Square and the Byzantine Chapel there is a traditional celebration giving guests a taste of authentic Cypriot village life with live music and folk dancing. There are four bars to choose from dotted around Anassa, formal or relaxed, inside or out, a chilled glass of champagne will taste delicious whichever setting you choose. Anassa is a 55-minute drive north from Paphos International Airport (approximately 37.5km distance). A range of transfers and shuttle services are available from the airport. For accommodation or part thereof cancelled 7 days or less prior to the arrival of the guests, the hotel will charge a cancellation fee of the full amount of the booked accommodation will be charged on Bed & Breakfast terms. 3 night deposit required at time of reservation. For accommodation or part thereof cancelled 21 to 8 days prior to the arrival of the guests, the hotel will charge a cancellation fee equal to one (1) night on Bed & and Breakfast terms. For accommodation or part thereof cancelled 7 days or less prior to the arrival of the guests, 100% of the accommodation fee will be charged on Bed & and Breakfast terms. Such a beautiful hotel.. I guess one of the most exclusive and best hotels in Cyprus! Excellent service.. excellent drinks & food ... comfy & huge rooms .. they do make everything they can to make your holidays amazing!! This is an amazing place. The location, the view, the decor, the surroundings, the SERVICE! Friendly, helpful and attentive staff ensured our glasses were never empty, that we were cleaned up after, that we were in the right place when we needed to move from one area to another. A stunning place that I would love to experience again! One of the best resorts in Europe. Amazingly located. Stunning interiors and spacious rooms. Fine dining at it's best under 200-year old olive trees with sparklung real candles simply unforgettable. The Spa is one-of-kind. The best of all is the wonderful, motivated and friendly staff. My number ONE in Europe. The best hotel on the north cost of Cyprus. very quite and peaceful. noticeably clean. it is recommended for relaxing weekend. only the out side parking is not good !